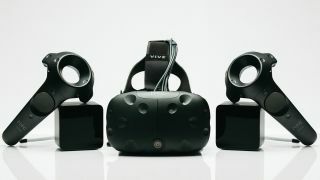 When they were announced at CES 2017, HTC’s new Vive Trackers were said to be intended to give developers the ability to more easily turn ordinary objects into VR-trackable objects. CloudGate Studio is a developer that’s already planning interesting ways to use the new trackers alongside standard HTC Vive controllers with its recent experiment into how they could make full-body tracking in VR a possibility. The VR developer recently posted a video to Twitter depicting how it was working on using the Vive controllers to make a player’s whole body an active part of a VR world rather than just their head and hands. By holding two controllers in his hands and strapping two to his feet, the company’s president and co-founder Steve Bowler was able to walk his full body through his demo creating what he called “a pretty good facsimile of a human body in VR”. He was able to reasonably accurately track the movements of not just his arms but his legs too and it’s all shown more clearly in the movements of a fully-dynamic shadow of his in-game avatar. Unfortunately for consumers, this wouldn’t really be possible to achieve, not least because it would require two Vive headsets and four controllers which is a serious expense. According to Bowler, though, replacing the controllers on his feet with the soon-to-be-released trackers could make it more viable for real-world application. Applying a tracker to the mid-section of the body as well as the extremities could offer even more in-depth tracking of movements like crouching. The new Vive trackers are designed to be applied to objects rather than body parts but in the future CloudGate indicated that it might have a plan for tracker-fitted shoes in the works. We think we could handle looking like Andy Serkis in his Gollum VFX suit if it meant a full-body VR experience. You can watch the experiment in action below.